Old Town Avondale Reception Hall provides all the beauty and quality service you need to make your special day come true. 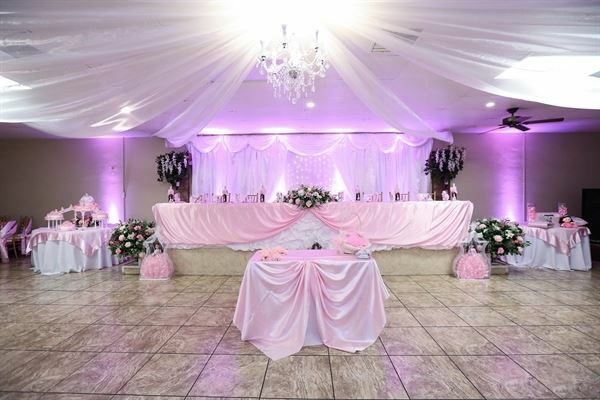 Our beautiful 4,500 square foot Wedding and Reception Center can accommodate up to 200 guests. Our goal is to exceed your expectations We are a one-stop-shop when it comes to crafting and planning your custom event. Our Mission: We are committed to provide exceptional products and services. Our packages are designed to make your event planning process worry and stress free. Let our defined quality and excellence in service create the setting for an unforgettable day! We specialize in Weddings, Sweet Sixteens, and Quinceañeras. Events at the Old Town Avondale Reception Hall at the bronze level begin at $4400. Events at the Old Town Avondale Reception Hall at the gold level begin at $6200. This package rate can be amended if your event has less than 150 guests. Events at the Old Town Avondale Reception Hall at the platinum level begin at $8000. This package rate can be amended if your event has less than 150 guests.